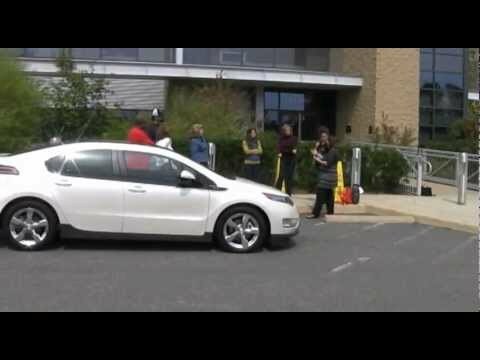 I recently bid adieu to our Chevy Volt. We had a lovely weekend romance, but now it’s back to my minivan. Like any relationship, we had our ups and downs. But, when all is said and done, I’m eagerly awaiting the day when an electric car can become a permanent fixture of our household. When Chevrolet offered the National Wildlife Federation a chance to spend the weekend with a Volt, I jumped at it. Chevy dropped off the car on a Friday morning and gave me a quick tutorial. There was no charge left on the battery after their drive from Maryland to my house, so I immediately plugged it in, which was super easy and took no more than a minute to do. I was hoping to get at least enough charge to get to work later in the morning. After just 90 minutes, the charge was enough to go 6 miles. Would have been more if I hadn’t blown a fuse when blow drying my hair! Who would have thought that the bathroom on the opposite side of the house was on the same circuit as the garage? Then, it was off to National Wildlife Federation Headquarters to do a little show-and-tell for staff. My home is only 4.8 miles from work, so I was able to get the whole way on the electric-only motor. The driving was very nice. Acceleration felt effortless, perhaps because you can’t hear the engine working through the gears. It handled really well in (suburban) traffic. And, it was fun to watch the display indicating the energy flow within the car: from the electric motor to the wheels when accelerating, from the wheels back to the battery when coasting and braking. I felt oh-so-very modern and sophisticated driving this car. Not only does it look way cooler than my minivan, but the sounds and the display were all new-age-y. Of course, it helped that there were lots of luxury touches in this car, part of the reason it comes with a hefty price tag of $44,680, or around $37,000 after $7,500 of federal tax credits. The funny thing is that I anticipated getting lots of stares from other drivers on the road. Maybe even someone wanting to have a little chat at a stop light. But that didn’t happen at all. In fact, I only had two conversations with strangers all weekend, and one of those people already owned a Volt. It occurred to me that the car actually looks quite similar to many other models on the road. Unless you were looking carefully, you might not notice that it’s a Volt. The styling doesn’t shout out eco car, like some of the other options on the market. Being indistinguishable from other cars actually might be a good thing for achieving wide adoption. Chevy refers to the Volt as an all electric car with extended range. Unlike other hybrid gasoline-electric cars, the Volt is always driven by the electric motor. When the battery charge is depleted, a gasoline generator seamlessly turns on to charge the battery. We wanted to see what it was like when the car switched on the gasoline generator. That turned out to be harder than expected. With one night of charging on our regular 120V outlet in our garage, the battery had enough range to take us 38 miles. That’s more than ample for running errands in our neighborhood, taking the kids for a hike at a nearby national park, and taking many neighbors and friends for short test drives. So, on Sunday afternoon I decided to take the car out for a longer drive specifically to drain the battery. I was on the expressway when it changed over. If I wasn’t eagerly anticipating it, I wouldn’t have noticed. The transition was that smooth. But, then I noticed that the car wasn’t as fun to drive anymore. The GM employee who picked up the car said it’s because the electric-only motor is more “torque-y” and could more quickly respond to my pushing on the accelerator. My main gripe with the car is that it can only seat four people. That means we can’t take our family of five on outings all together, much less have the kids bring friends along or participate in carpools. Put this technology in a minivan and I would be the first in line. But at this size, it will never make sense as the primary vehicle for our family. It could be a good second car, primarily used by the spouse who is commuting and not carpooling. But, the price tag makes it a little hard to justify for cost-conscious families. Let’s hope that as the cars become more widely available and other competitors enter the marketplace, the price will come down. In fact, GM says that they will be offering less expensive versions with fewer luxury features in 2012. And Toyota is already accepting priority registrants for the Prius plug-in hybrid promised by Spring 2012. As my time with the Chevy Volt drew to an end, I couldn’t help but feel hopeful and excited about the future of automobiles. This car is not just for eco-enthusiasts. It was fun to drive and attractive. I could easily imagine how this car could make our lives better – fewer trips to the gas station and much less money spent on gas. And, it’s just the sort of ingenuity that will help us achieve the significant reductions in carbon pollution needed to curb climate change.